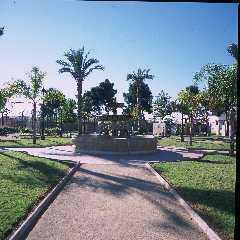 The name of the park originates from what was, many years ago, in 1850 to be exact, the construction of a water processing plant, whose role was to provide fresh water to the city of Valencia and the surrounding towns, in order to eliminate epidemics and plagues. For over 60 years this complex provided purified water to the City of Valencia using the technical knowledge of the time. This installation was structured by enormous pools of water and a series of filters through which the water circulated until arriving at the first deposit. Nowadays, the only space that is conserved of the original complex has been converted, following its restoration, into an exhibition space. Distinctive features of this construction are the early use of bricks in the finish, and the impressive example of 19th Century civil engineering adapted to an industrial use, in which the famous engineer Ildelfonso Cerdá participated. 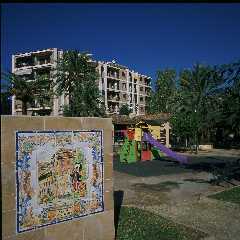 The "Thematic Park of Valencian History": A garden area in which a series of ceramic panels have been installed, which contain illustrations of the Valencian comic character "Pumby", and which offer us a chronological view of the history of the Valencian Community from the Stone-Age up to the current century. Also within the park is the previously mentioned "Filters Exhibition Space", whose entrance is at the end of the grounds, and which offers a programme of temporary art exhibitions.